Cyril Ramaphosa has officially been sworn in as the new president of the Republic of South Africa, following Jacob Zuma's resignation. Ramaphosa has been sworn in as President of South Africa. A medical doctor, mother of four and wife of Cyril Ramaphosa, this is one strong, talented woman. Now that Jacob Zuma has finally resigned and Cyril Ramaphosa is set to become acting president, Dr Mostepe is set to be the new First Lady. Equity investors reacted with euphoria to Jacob Zuma’s resignation as South African president, with stocks soaring the most in more than three years. Cyril Ramaphosa, who was elected as Zuma's successor on Thursday afternoon, is expected to pursue market-friendly policies. According to a statement released by the Presidency, president-elect Cyril Ramaphosa will be sworn-in by Chief Justice Mogoeng Mogoeng at 17:00 on Thursday, following his election by the National Assembly. 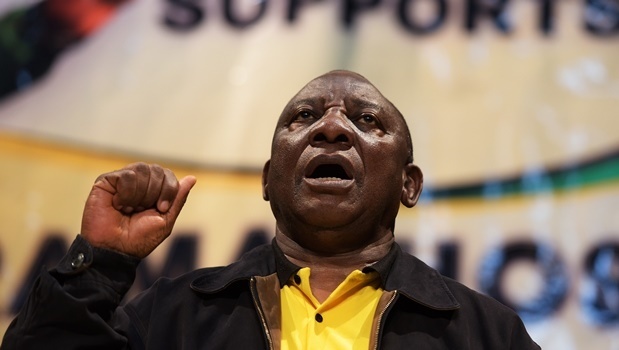 ANALYSIS FROM PARLIAMENT: Will President Elect Ramaphosa usher in a new SA? While Jacob Zuma's resignation after his ANC recall means Parliament will no longer have to debate a motion of no confidence, there is still the matter of making official the appointment of Cyril Ramaphosa as the president of the republic. News24 Editor in Chief Adriaan Basson and Politics Editor Mahlatse Mahlase discuss the latest developments. Watch. Cope says that former president Jacob Zuma should have been impeached, rather than being allowed to resign. And they have no time for incoming president Cyril Ramaphosa, viewing him as someone who, like Zuma, broke his oath of office. Cope addressed the media on Thursday morning, after Zuma's resignation the night before, and expressed mixed emotions about this event. ANC treasurer general Paul Mashatile says the ANC has confidence in President Cyril Ramaphosa. UDM leader Bantu Holomisa says Ramaphosa must understand that the problems of the country can't be solved by a single political party. Ramaphosa completes his first speech as the president of South Africa to a standing ovation and rapturous applause, from ANC and opposition MPs alike. Ramaphosa responds to Maimane directly. Ramaphosa: "I seek to execute that office with humility, faithfulness and dignity..."
Ramaphosa thanks all members of National Assembly for the honour of electing him for this position. He says it's a great privilege to serve the people.